This colume provides wholesales,retail and production material needed for polymeric insulator (also called composite insulator of silicon rubber insulator) of overhead lines from 11KV,33KV up to 400KV. This includes but not limit to FRP/ECR cores(fiberglass rod),raw silicon rubber materials,metallic fittings,bonding agent and etc. 33KV composite pin insulators are used on 33KV high voltage overhead power distribution lines. These pin insulators are made by FRP core, silicon rubber and metallic fittings. On bottom side of fitting, it is where we call pin, the pin has screw which is used to fix the insulator onto the crossarm. On header fitting, it usually has groove shape to fix conductors. 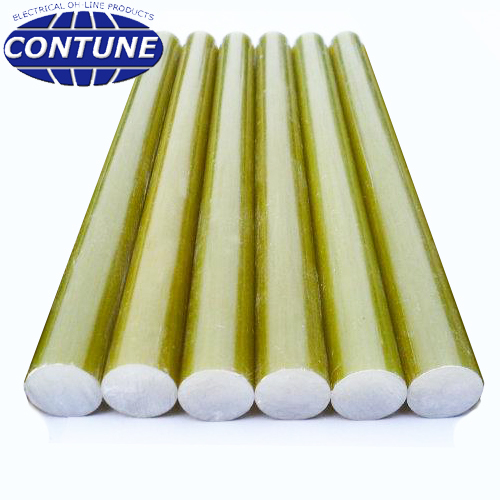 Fiber glass rod is used for production of silicon rubber insulator of electrical overhead lines. It is an important part of composite insulator and core material of composite insulator.